— Crisscrossing campus cycle paths would have massive permeability effect beyond staff and students. 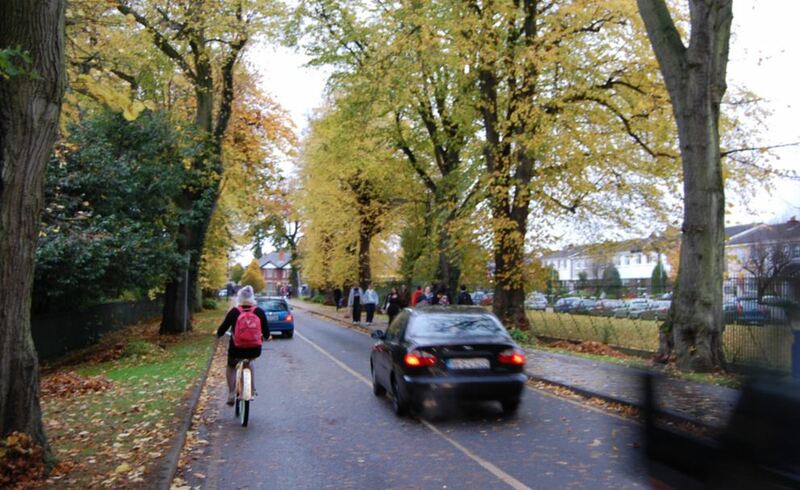 COMMENT & ANALYSIS: Four metre wide two-way cycle paths should crisscross Irish third level educational campus — or, at least, that’s the way it would be if any of them were willing to put their money where their mouths are on sustainability, active travel and climate change. Not shared paths. Not shared with cars and definitely not shared not shared with pedestrians. Cycle paths. Dedicated and segregated. Joined up and connected. Space for cycling. Some readers will think ‘this sounds all fairly logical’, but Ireland has one campus under construction inside the canals in Dublin without a single sign of a cycle path (DIT at Grangegorman) and there has been very few attempts at retro-fitting high-quality segregated cycling. And when we say high-quality we mean Dutch-like. Too many Irish architects and transport planners don’t get cycling the way their Dutch counterparts do. Even where they do their clients won’t fund it. But many Dutch universities used to make Ireland’s car-dominated universities look good. Take the Delft University of Technology above. There was a major road right in the middle of the campus. But they changed it. Here’s the redesign — good bye road and parking, hello park and sustainable transport. If such a car centric space can be so radically transformed, there’s hope for Irish campuses. For reference: The angles are vastly different in the images but the tower building and the four blocks beside it are visible in both photographs. Also, the black building in the centre bottom of the ‘after’ image, is partly visible in the centre left of the ‘before’ image. This is a section of the above space today. It has been transformed to a place rather than a road. The cycle paths, both primary (left) and secondary (right), don’t reduce the sense of place. In most Irish third level campuses, the scale of projects do not need to be at the level of what happened in Delft. And a network of paths does not have to be built at once. For example, Dublin City University could just follow through on a previous proposal to close of the campus’s Ballymun Road entrance to cars. The current road space could be split between a large two-way cycle path and an enlarged footpath. 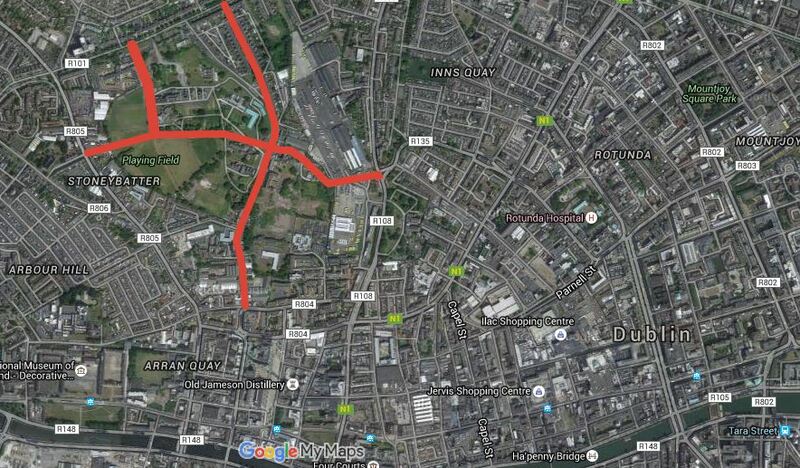 But the real network would come when cycle paths crisscrossed the campus and intersect with the Dublin City Council park beside the campus. Meanwhile, in Galway bridging the River Corrib and the canal would create a high-quality link between the core NUI Galway campus, a small island campus and Galway city centre. Dealing with the nearby narrow roads with heavy traffic might be unrealistic at this stage for Galway. 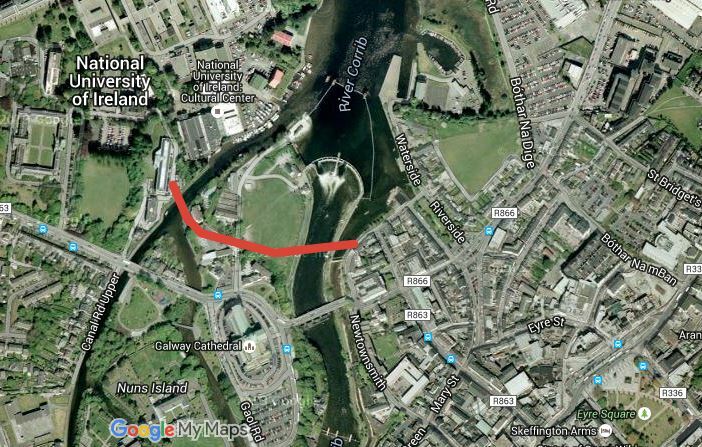 Within the core campus the planned Galway to Moycullen greenway could be designed to act as a route for students who want to cycle but don’t want to mix with the cars heading to the campus’ car parks. But, like other greenways, the Moycullen greenway looks to be a long way off, so the university should act in advance of the full greenway. While older campuses would need to be retrofitted, the redevelopment of Grangegorman — just a stone’s throw from O’Connell Street — so-far looks to be the largest State-designed permeability failure of the last 15 years or more. The campus is the new home of the Dublin Institute of Technology (DIT), but really Dublin City Council, the Grangegorman Development Agency, and, even, An Bord Pleanala have a lot to answer for in terms of access and the lack of vision for cycling. If Ireland cared about sustainable transport and cycling, the above route as a dedicated two-way cycle path would be the minimum compliance with orders by An Bord Pleanala for permeability. A 1km walking and cycling route within the canals with no crossing of a major road — it would be amazing for permeability and sustainable. Not just for students and staff, but for a large chunk of the city. But Ireland, Dublin City Council, and the Grangegorman Development Agency don’t act as if they care about cycling or planning conditions around access — we’re not planners or planning inspectors but primary access in our view is not in place where it should be. Ah, but the campus won an town planning award — well so did London’s olympic site which is also criticised for its poor cycling provision. There’s a lot of good design on the campus, but it just happens that cycling and access is not near as good as it should be. Given what An Bord Pleanala ordered, it’s strange then that the DIT website refers to the above map and states: “The pink, blue and green areas on the diagram below are those that are accessible to staff and students from September 2014.” Access to Constitution Hill? No sign of it? 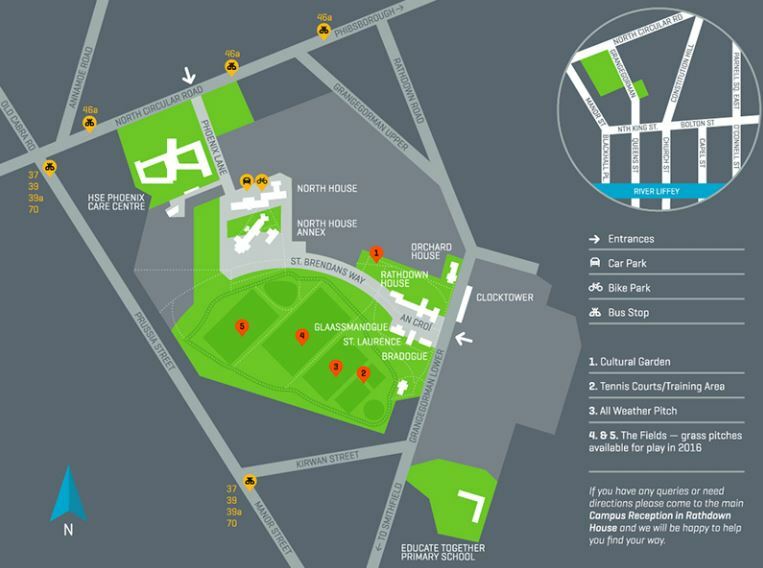 The more recent map, also from DIT’s website, shows little change and does not even include the now opened western entrances. Or are we misreading the map again? An article on dublininquirer.com shows that the access points are limited by time and are sub-standard for cycling (not segregated, barriers in the way etc) compared to best practice in Europe. It confirms that there is no space for cycling — there’s shared use footpaths. People on bicycles have to mix with mothers with prams, children running to the playground, and students ambling around — not a great mix for anybody. It does not add to the “sense of place”and it increases conflict between users and damages potential suitability. Even if you can put up with shared footpaths within the campus, in one case the article has a picture of a pedestrian barrier blocking direct cycling access from the campus to the roadway on Fingal Place. An Bord Pleanala seem to have tried to make clear how important permeability is, it wrote in its planning condition order: “It is considered that a western access point is critical to the development of the campus at the earliest opportunity.” And it amended the status of access routes for clarity. The access points pictured and described by dublininquirer.com — including timed opening hours, pedestrian barriers and narrow lane ways — hardy seems fitting. Not for cycling anyway and the gates which are closed at night is worse again for walking given such long detours. With just a bit of vision they could have went even further. The Grangegorman Lower and Upper (note: ‘road’, ‘street’ etc is not part of the streets’ title) could have mainly been made into an north-south cycling and walking route, with cars only having limited access. This would have stopped the current rat run from becoming worse with traffic going to DIT, the primary schools, and medical units. But we can hardly expect vision when we’re stuck in the land of shared footpath, time-limited access and pedestrian barriers? If it does not want to look at compliance in this case, it’s clear An Bord Pleanala needs to be even more prescriptive in future. You don’t mention the University of Limerick, which has recently put a good deal of Smarter Travel money into cycle infrastructure. Some is very good: showers, secure and weatherproof bike-parking. However, in terms of bike routes, all they’ve done is put bike stencils on footways. Admittedly in doing so they widened and straightened some of the footways, and made better links with the better county council provision outside the campus. But some of the footways have such heavy pedestrian traffic that I would consider it negligent to force cycles into the mix. And then we have two bridges over the Shannon. One is a road bridge with a separate section for a cycle track — which pedestrians are obliged to share. The other is a pedestrian bridge, on which bikes are banned! Another brilliant article Cian, I remember being in Grange Gorman last year when a hi-viz suited chap was getting people bringing their children home on their bikes to dismount as they were crossing the campus. There is a top down anti bike culture that pervades our institutions and it needs articles like this to remind us to question it at every oppertunity. Fair play Cian, thanks for posting this article. 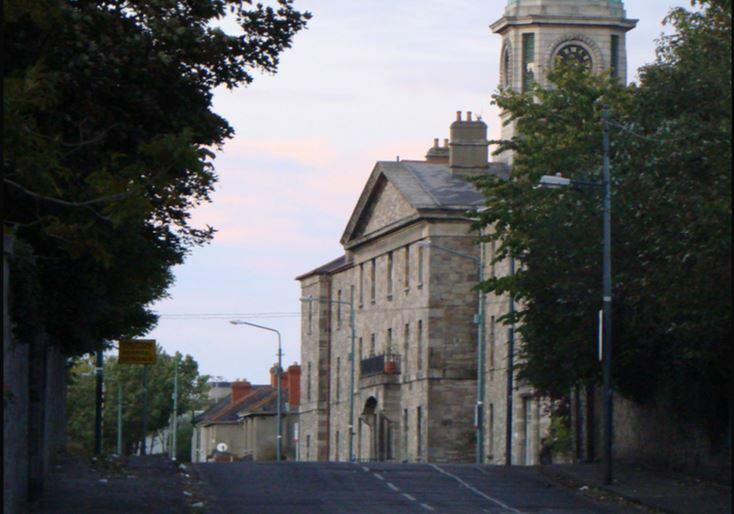 Grangegorman is a great opportunity to set a new benchmark for this kind of campus. If anywhere should by cycle friendly, it’s a city centre educational campus. Most of the people there will be students with a limited budget. The city centre location means the best options to get there are walking/cycling/public transport. 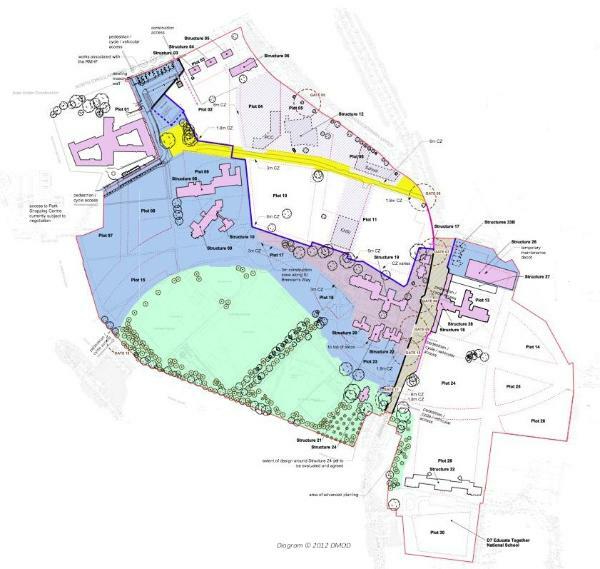 It’s disappointing to read that shared walking and cycling is seen as an acceptable option in a brown field site. This should really only be a considered when retrofitting cycleways. Bit disappointed with that article (and the comment above). I work in DIT Grangegorman, having worked in three other universities previously. The overall design of the campus is incredibly cycle-friendly. There are 140 Sheffield bike stands compared to 14 car parking spaces, free showers in every building, lockers for wet gear, a secure bike compound accessible by swiping your student card. The main thoroughfare IS a shared space with pedestrians, but I cycle through it every morning with my son as do dozens of other local residents, and it hasn’t been a problem. As regards the access to constitution hill – the site east of Grangegorman Rd lower hasn’t been opened yet. I think if you had contacted the Grangegorman Development Agency or the DIT Campus Planning Office they would have addressed some of the issues you raise, and possibly agreed that there was more work to do. Disappointing research (but I enjoy the website otherwise, so keep it up! ).